Shop for outdoor clothing, camping and travel gear with Kathmandu. Take a look at our special offers on our huge range today. Some retailers have their own policies and restrictions. 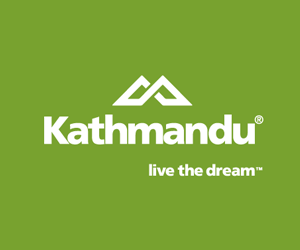 Before shopping, please ensure you review the Special Terms of Kathmandu (above) for further information. Complete your purchase in one session and without leaving Kathmandu. Do not click on any bookmarks or advertising banners or links once you leave ANZ Bonus Points Mall. Restrictions: Conditions apply. While stocks last. Free domestic shipping is offered for all purchases over $100 made within Australia. For orders under this amount, we charge a flat rate of $10. We use Australia Post’s eParcel service and can deliver to your home address, work or PO box anywhere in Australia. We do not ship to freight forwarders, armed forces or AFPOs. Domestic shipping takes 2–7 business days, plus an additional 1–2 days for rural and remote areas. All prices in the shopping areas are in Australian dollars (AUD$) and include GST (10% sales tax). We accept PayPal, MasterCard, Visa, American Express and Kathmandu gift cards for all online purchases. If you change your mind on an item purchased online, you can receive a full refund. Goods must be returned in original condition, with proof of purchase, within 30 days of the purchase date. You cannot exchange or return selected base-layer items such as underwear, for hygiene reasons, or goods sold as ‘seconds’. You can either return the item to one of our stores or send it by post. We do not cover the cost of delivery for change-of-mind returns. Return postage must be paid for by the returnee.